At the beginning of Cannes 2014, I wrote an article about a book that my girlfriend showed me and let me borrow during the festival. Titled "Two Weeks in the Midday Sun", the paperback includes 182 pages of notes and sketches from Roger Ebert's trip to the 1987 Cannes Film Festival. He had already been attending for over 10 years, and was a regular (which is how I feel, though I'm only at my sixth year). I wrote that he was blogging before blogging even existed, and so much of what he wrote then still mirrors our experiences even today. Even though so much of it has changed, too. It's a fun book to read and I occasionally referenced it with friends throughout the festival. It's hard to find, with copies going for $40+ on Amazon nowadays. With my own two weeks in the 2014 midday sun finished, I wanted to write one last tribute to Ebert, to all the critics who come to Cannes every year. Even though I don't agree with many of them, even though I'm only friends with a few of them, even though I often refuse the title of "critic", I'm still honored to be a part of this group. And I'm humbled by the fact that Ebert's experiences are so similar to my own, from the way he struggles to find working internet and to his strolls down the Croisette late at night, quietly observing all the different people in this small town in the South of France in the middle of May. He even gets into fights with others critics too, as I wrote about earlier in the festival here. It's all just part of the Cannes experience. 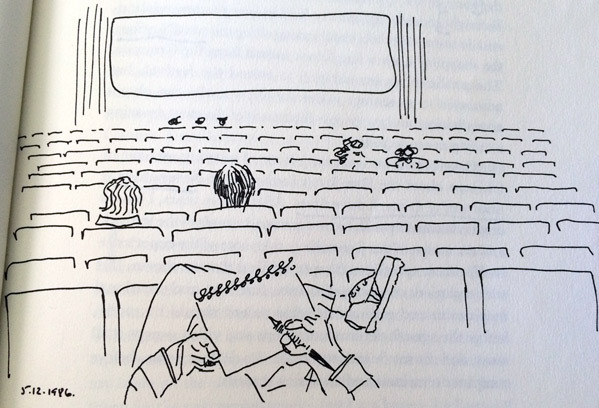 A sketch from Roger Ebert's Two Weeks in the Midday Sun, from Page 7. Cannes (the festival and the town) is a wonderful place, and every year I go back I feel lucky that I'm one of the few who gets to partake in this crazy festival of cinema for two weeks. However, I also recognize that I'm here not just for myself, but also to inspire and encourage others. Whether that's encouragement to come to Cannes and join in the fun, or simply to explore the depths and peek around the corners of cinema, or to discover new filmmakers, to take risks on films you might not like; to appreciate all of the different voices in the world, no matter where they come from. That was what Ebert came to Cannes for - to find new voices, and great films, amidst the sea of cinema, and bring attention to them in hopes that they find an audience. One of the big differences in my own coverage is that I don't have as many stories about meeting celebrities and going to yacht parties and drinking expensive champagne with producers and agents. While I do have many stories that involve making new friends (who were very happy to see Winter Sleep win the Palme), complaining about other critics leaving screenings right before the end, and interviewing director David Michod with Guy Pearce nearby, my experience at Cannes is all about the films. That's my focus, and that's why I go to the festival. I grow the most as a cinephile at Cannes, learning to appreciate different styles of cinema, meeting talented filmmakers (Jodorowsky, Dardennes, Ruben Östlund), and maturing as a writer. "Walking back along the Croisette in the moonlight, after midnight, I took my time. Some of the drifters who had arrived in town for the festival were gathered in quiet circles, drinking wine, playing guitars. Down on the public beach, there were a few people with sleeping bags, who had not yet discovered that the police would not let them stay there. The great hotels rose on the other side of the palms, and on either side, out at the ends of the bay, I could see the lights of the highway curving, in one direction toward Napoule, in the other toward Cap d'Antibes. I felt the kind of familiarity that you develop in a place after you live there, and it occurred to me that I had lived in Cannes for six months, two weeks at a time. Two weeks at a time had always been enough." I feel the same. It's my other home, that town on the beach in the Cote d'Azur in the South of France. I know the streets, I know the restaurants, I know every last cinema, and I miss it already. I'm not up to six months yet, but I am up to two months of living there, and I can say with certainty I know that feeling he's talking about. But that's the Cannes Film Festival for you, and that's what it's like as a critic, as a movie lover, to spend 12 days watching films in France. It's an experience I wouldn't trade for anything, and a world that I encourage any and all movie lovers to get lost in. Go for the films, not for celebs, and you'll fall in love, too. 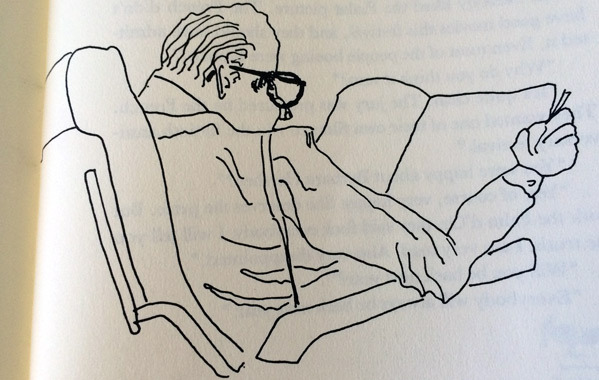 A sketch from Roger Ebert's Two Weeks in the Midday Sun, from Page 181. Thank you, Roger Ebert, for showing me the way. Thank you to all my friends, my colleagues, fellow critics, all the filmmakers, all the publicists, the Cannes staff and security, thank you to everyone at the festival and related to the festival for always making it an unforgettable experience. If you're curious, I recommend finding a copy of Ebert's Two Weeks in the Midday Sun to read just for fun. If not that, at least watch Life Itself and bookmark RogerEbert.com, where his legacy still lives on. Find all of my Cannes 2014 posts here. My list of favorite films, with Xavier Dolan's Mommy & Bennet Miller's Foxcatcher, is available here. Excellent article, Alex. Cool that you met him and read his stories; he was a great critic and writer (I always enjoy reading his reviews, even if I disagreed with some of his critiques). Roger also helped me about analyzing a film through his TV shows. He was one of a kind and will be missed. I look forward to Life Itself.